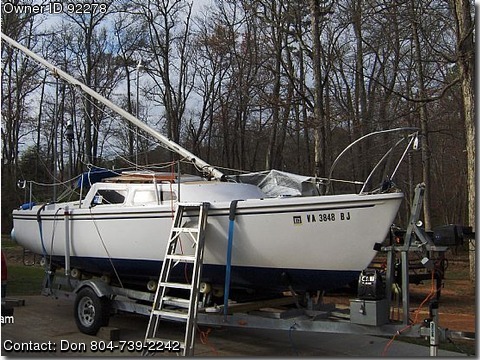 Call Boat Owner Don 804-739-2242. Basic Decription: 1979 Catalina 22 Sail Boat Swing Keel Lots of updates to the Boat and the trailer.New cushion covers, and cushions for bench seats, new quick release pins and other hardware. Trailer has new Titan Disc Actuator wsolenoid, KODIAK 10" Trailer Disc Brake Assy, S-CAD , wheels and brake lines also rollers added to trailer. Trailer is Galvinized, Led Lights and a boom for raising Mast.